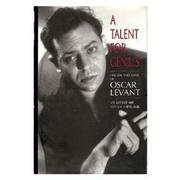  Why does Oscar Levant, memorable mostly for his devastating put-downs, deserve a biography at all, let alone one this long? Kashner and Schoenberger answer that question convincingly. This husband-and-wife team of poets (both teach writing at the College of William and Mary) make an auspicious nonfiction debut with this biography. At one time Levant was the highest-paid concert artist in America, and one of the most popular. But by the time of his death he was remembered mainly as a deeply troubled yet very witty man, best known for a series of terrifyingly frank appearances on the Jack Paar Show in which he discussed his barbiturate addiction and nervous breakdowns with a candor unheard of at the time. In fact, as this biography makes clear, Levant was, in spite of an almost hallucinatory catalogue of neurotic compulsions and phobias, a composer of promise, a talented pianist with a wide range of musical strengths (although most widely remembered for his interpretations of Gershwin, his close friend), and a man of uncommon intelligence and erudition. The son of Russian-Jewish immigrants who raised him to love music, Levant was an autodidact who entered the most elevated literary and musical circles of New York and Hollywood from the Jazz Age into the Eisenhower years before mental illness and drugs wrecked his health, his marriage, and his life. The book retells this story in great detail, but almost never drags. There are several minor errors in passages of historical background (Babe Ruth made his debut in the Yankee outfield in 1920, not in 1922). A genuinely thoughtful and entertaining biography that should go far in rebuilding Levant's reputation as a serious musician.